Pennsylvania Department of Transportation’s reconstruction of Route 291 in the City of Chester included a new bridge across the Chester Creek. 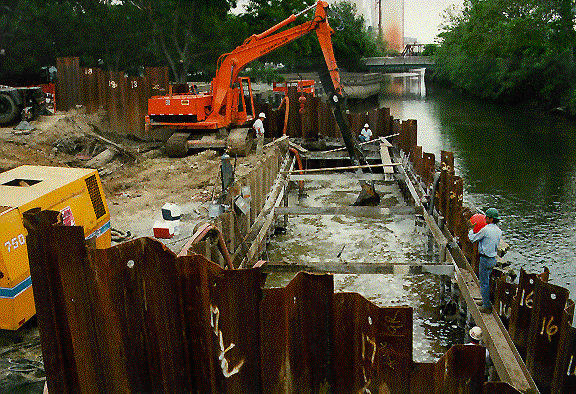 Two, braced, steel sheet pile cofferdams were required to construct two new bridge abutments. Designed by Peirce Engineering, one cofferdam allowed excavation in soft silt and installation of drilled-in, 10 inch diameter, foundation pipe piles while the other cofferdam allowed wet excavation to bedrock and installation of a tremie-poured concrete base below the new abutment footing. The cofferdam depths varied up to approximately 23 feet in order to reach the steeply sloping bedrock.